The very first teeth your baby gets maybe temporary but at the same time they need to be cared for. Getting your baby to brush his or her teeth from a young age will help build discipline. It is a proven fact that any baby teeth that are lost prematurely due to decay can cause problems in respect to development in speech. So, if you are really keen to know when to start brushing teeth for your kid simply keep reading. Yes, having a baby could be tough, but it is worth all your efforts, believe me! When Is The Right Time To Begin Brushing? You can start immediately when your baby starts to get the first tooth. You may consider using your finger, gauze pad, damp cloth to clean the teeth and also the tongue. Do this right after major meals and once before your baby goes to sleep. You may consider using toothbrushes that are lightly moistened and have a microscopic quantity of toothpaste smeared on the bristles. Make sure you use a soft tooth brush and discard any toothbrush that has frayed bristles. What about brushing the Gums? Dentists strongly recommend that it is very necessary to clean the baby’s gums right after feeding as it prevents the growth and accumulation of bacteria. Do not clean the gums with a toothbrush you may consider using a damp cloth of a gentle finger brush. Make sure to use very gentle strokes. The Dental Association strongly recommends that babies are given a brush with fluoride toothpaste as it will help to eliminate the chances of cavities growing on the tooth and causing damage. However the quantity should be no bigger than a grain of rice. Children who have hit 3 years may consider using a larger quantity. Once your toddler turns 2 years you must teach him how to spit out the toothpaste from the mouth. Once your baby is a bit older he will try to brush on his own so go ahead and encourage him but be there to supervise the process. After that make sure you do the second round of cleaning just to make sure that the teeth are completely clean. To make things fun, buy your baby a colorful brush with animated cartoon characters on them. The truth is that not every single baby out there will love the process of their teeth getting a good scrub. If your baby happens to be stubborn then here are some really helpful tips that will make things a lot easier. 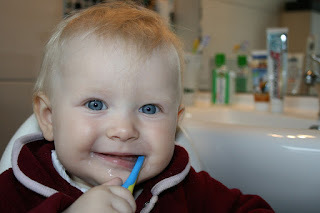 Make it seem like a game: Your baby will show a lot of curiosity towards the toothbrush so take advantage of this and make the brushing process a fun game like activity. Demonstrate the process: Once your toddler sees what you are doing he may want to imitate you and you should go ahead and encourage him. Make sure that he does not hurt his gums by brushing too hard. Try to distract with a song: This should be done when your baby is very stubborn, so you may try to sing nursery rhymes with the words toothbrush and tooth thrown in them. 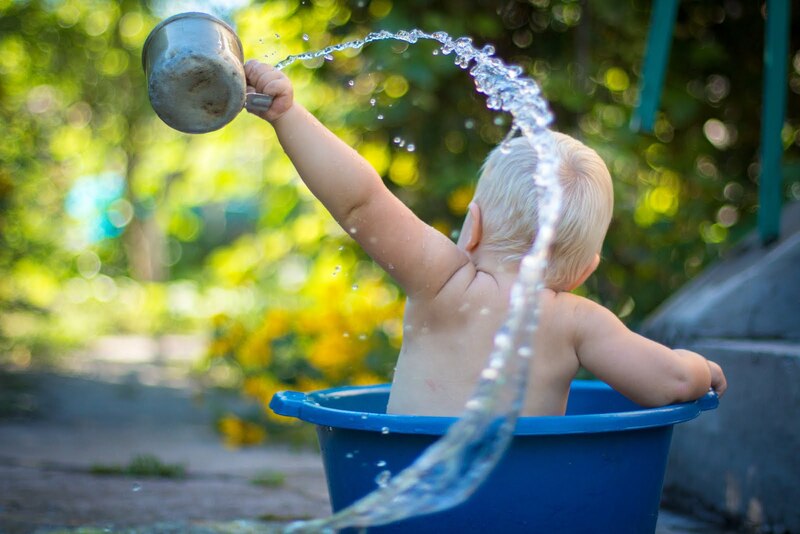 Be gentle: Managing a baby with tantrums can be tough and so you must maintain a certain level of patience. So try to brush his teeth and gums with gentle movements. You may consider using a washcloth and soft brush for comfort. Getting your baby to follow good oral hygiene is an absolute must so you can make it fun by buying colorful and attractive brushes. Try to by finger brushes made of silicone as these are relatively soft. These have a soothing effect on the gums once the teething process starts. Once your baby is old enough to hold a toothbrush you could consider buying ultra-soft brushes for children. These brushes have good grips on the handles that make them comfortable to use. You must make sure that you are buying toothbrushes from reputed brands whose products are non- toxic. Make certain that you are supervising the brushing process to make sure your baby is doing things right. These were some of the vital information when it comes to learning about when to start brushing teeth. You should keep in mind that the baby teeth may not be big but they are of importance as they act as placements for the adult teeth. Also your child will need to have strong baby teeth to be able to chew food properly so it is digested properly. 2 comments on "Parent’s Guide: When To Start Brushing Teeth For Your Child"
Thanks for sharing this amazing article with us! Visiting MDS dentist Vaishali nagar Jaipur was the best decision that I took to get teeth whitening. I was worried about the discoloration of my teeth. But Mr.Dorwal treated me with chair-side whitening under carefully monitored conditions that alleviated my discomfort. Mr.Dorwal holds expertise in Esthetic dentistry and is best dentist in Jaipur.